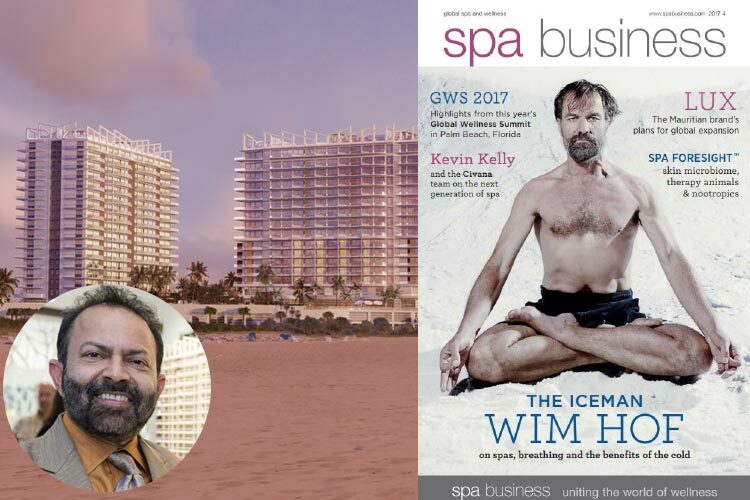 Developer Dilip Barot, the founder of Creative Choice Group, is building what he calls an “urban destination spa resort’ on Singer Island in Palm Beach, Florida with a 100,000sq ft, four-story ESPA spa. Spread across seven acres on the Atlantic shoreline, the Amrit Ocean Resort & Residences will have a focus on wellness lifestyle, taking inspiration from Patanjali yoga, and is due to open in 2019. The development will incorporate mindful living, Eastern traditions of inner science, and Western luxury. Practitioners will focus on preventative maintenance and personalized wellness. Tower P (Peace) will be a resort residential tower with features such as posture-supportive heat reflexology floors, mood-enhancing aromatherapy, vitamin C-infused showers, exterior sound-extrusion block, and dawn simulation. Tower H (Happiness) will offer a hotel/residential mix and will house the spa, which will include yoga studios, a meditation garden, whirlpool spa and private beach club with cabanas.